Build a Partnership with a Law Firm That Will Strengthen Your Business. 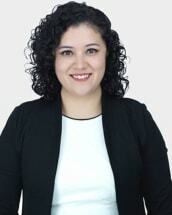 Alexis Espejel is an attorney at Leslie Wm. Adams & Associates focusing in commercial litigation and transactions. Her practice includes entity formation, corporate governance, general corporate matters, contract drafting and review, business development, real estate transactions, oil and gas, business litigation and trademarks, among others. Prior to becoming an attorney, Alexis worked at Leslie Wm. Adams & Associates for 4 years as a law clerk, learning and gaining experience under the tutorship of Les Adams. She also worked as a legal assistant to the general counsel of a real estate company and as a legal assistant at an immigration law firm. Alexis acquired her Bachelor of Business Administration in Management from the University of Texas at San Antonio, where she earned a position on the Dean's List for her academic performance. Thereafter, Alexis received her Juris Doctor degree from Thurgood Marshall School of Law, where she also earned a position on the Dean's List. Alexis is fluent in English and Spanish. She is also a member of the State Bar of Texas, American Bar Association, and Houston Bar Association. In her spare time she enjoys traveling, exploring historic places, and spending time with her family and pets Kyra, Koda and Xenia.